even more impressive gains at the same boost level! solutions for automotive, marine, industrial, aeronautical, and other motorsports applications. If you’ve never loaded up your Mustang and headed out to Mustang Week in beautiful Myrtle Beach, South Carolina, you’re doing it all wrong. This event is one not to be missed – a bucket list addition, if there ever was one. With thousands of Mustangs cruising through the beach town, you can hardly look around without seeing (or hearing) at least one. This year, we packed up and headed down for the final two days of shows at Myrtle Beach Mall. As someone who has attended this event three of the last four years, I can tell you that every year, it grows. We are quickly outgrowing the mall, so we were absolutely always busy in our time there. Mustang Week staff tells us that there were approximately 3,000 Mustangs and 10,000 spectators in attendance last year, and we can pretty much promise you that that number has grown. ROUSH Formula Drifter Justin “JTP” Pawlak was in attendance with us, as was Lyle Sturgis of Tindol Ford with three ROUSH Mustangs that he has for sale. We brought the ROUSH Motorcraft Mustang down with us, and Brian McCarthy from Vossen Wheels displayed his brushed aluminum-wrapped ROUSH-equipped Mustang. For an hour each day, JTP met with fans and signed autographs – he even signed a few car parts, a dashboard, and a little girl’s cast – and we also maintained a steady flow of traffic to sign up for our ROUSH Performance newsletter and take home a ROUSH beach ball, koozie, or lanyard. Roush Yates was in attendance both Friday and Saturday selling and installing ROUSH Performance Parts on show cars. Before we got there, enthusiasts enjoyed a Meet and Greet on Tuesday, a day of fun runs and autocross on Wednesday, and some test and tune action on Thursday. Friday brought the 11th Annual Car Show sponsored by LatemodelRestoration.com to Myrtle Beach Mall, where vendors lined the perimeter of the parking lot with registered show cars in the center. The spectator lot was like an additional portion of the car show – packed with Mustangs, Lightnings, and other Ford-powered vehicles. On Saturday, the Mall was attended by the East Coast’s Largest Mustang and SVT Cruise-In followed by an awards ceremony. Check out the pictures from our time in South Carolina and let us know what you think. Will we see you next year in Myrtle Beach? A cold air intake is arguably the most common bolt-on modification across the board. It’s rare to come across even a lightly-modified Mustang that hasn’t had one installed (except maybe in California). So what’s the hype? Why is it one of the first modifications that Mustang owners choose to purchase and install? The answer is simple – it’s the first step to unlocking untapped potential regardless of the power plant under your hood. They’re also reasonably priced and super easy to install. 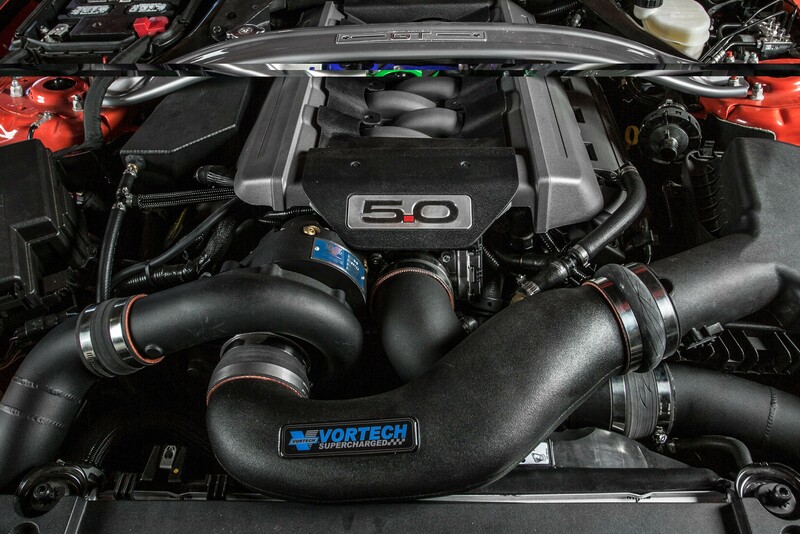 And now, with ROUSH’s new line-up of Cold Air Intake Kits for the 2015 Ford Mustang, you have an even better reason to add one to your list of modifications. Just recently, we put each of our 2015 Ford Mustang Cold Air Intakes to the test on our dynamometer and we have the resulting real-world horsepower and torque increase numbers for you! Mustangs equipped with the 5.0L power plant saw gains of 10.4 horsepower and 8.54 lb-ft of torque, while the V6’s power output increased by 10.52 horsepower and 9.8 lb-ft of torque. Finally, the Mustang’s EcoBoost four-cylinder engine saw incredible power gains of up to 29.6 horsepower and 27.89 lb-ft of torque. So how do Cold Air Intakes work? Cold air is denser than warm air – molecules are closer together in cold air, meaning there is more oxygen in a specific unit of cold air than there is in the same unit of warm air. To be clear, it’s oxygen that your engine needs to burn fuel efficiently, not air. In turn, greater cold airflow unlocks a higher potential for power and fuel efficiency. Think of it this way – when you walk outside in cool weather, it’s easy to take a deep breath of air, but when you walk outside on a hot day, the air feels thicker and it might seem to be more difficult to take a deep breath. Your engine breathes in much the same way as you and I do. 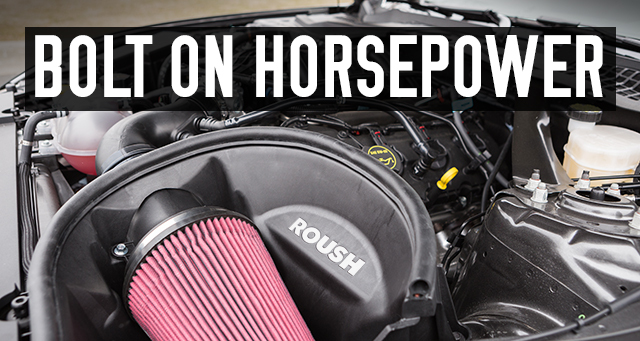 That being said, ROUSH Performance’s Cold Air Kits help your 2015 Mustang breathe better – whether you opted for an EcoBoost, V6, or V8. For the first time, these kits utilize something called ROUSH “Dry” Filter technology. The reusable filters are built and proven to retain their shape under high airflow, and are composed of inner and outer layers of wire mesh to guarantee durability and reliable support of the double layers of media within. Each layer of media does a separate job: the outermost layer is composed of specifically-designed synthetic needle-felt polyester designed for wet and dry filtration to capture any major contaminants, and the inner layer is made of wet-laid/chemical bonded rayon/polyester, to capture remaining contaminants. All of this filtering might lead you to believe that airflow is restricted, but this is not the case at all – in fact, the filter offers less restriction than comparable kits, as well as a reduction in pressure drop. Along with increasing the performance of your Mustang, ROUSH Cold Air Kits will slightly change your Mustang’s rumble, and they look much sleeker than the stock air box under the hood. 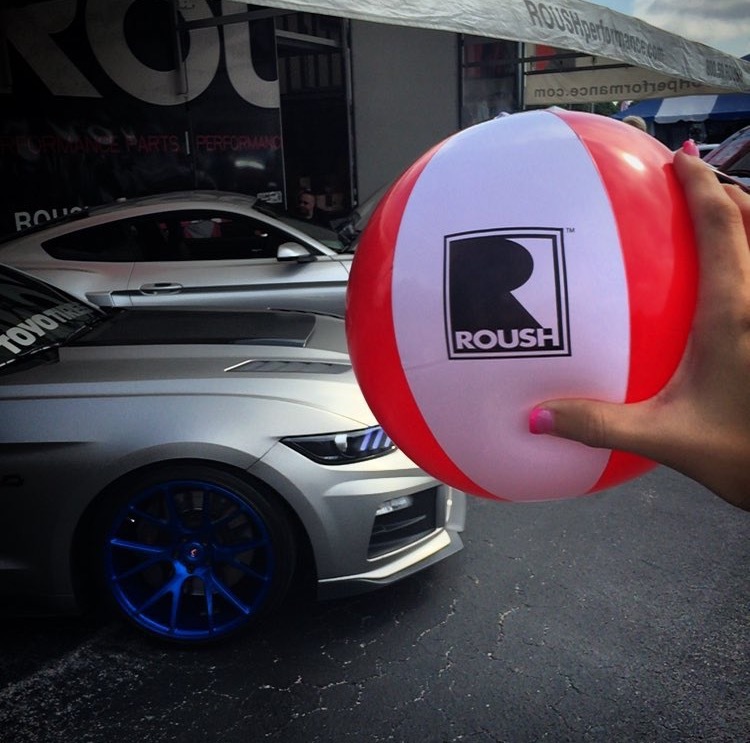 ROUSH Mustang Cold Air Kits are engineered and tested to ensure that calibration changes are not necessary, and factory mounting locations, emissions, hardware, and vacuum lines are utilized to allow for easy installation. As always, 2015 ROUSH Mustang Cold Air Kits are protected by a 90-day ROUSH Parts Warranty and will be available for order in July 2015. The air filter with the clamp, injection-molded lower air box/tray with installed EPDM foam hood seal, Blow Molded clean air tubes, heat extractor foam insert, and all required mounting hardware are included with the kit, which is proudly manufactured in the USA. Now you know the benefits of installing a ROUSH Cold Air Kit on your Mustang (we also offer F-150 cold air intakes) so you can make an educated purchase. Just remember, these kits do NOT fit ROUSHcharged vehicles as they are designed with their air box as a complete package. 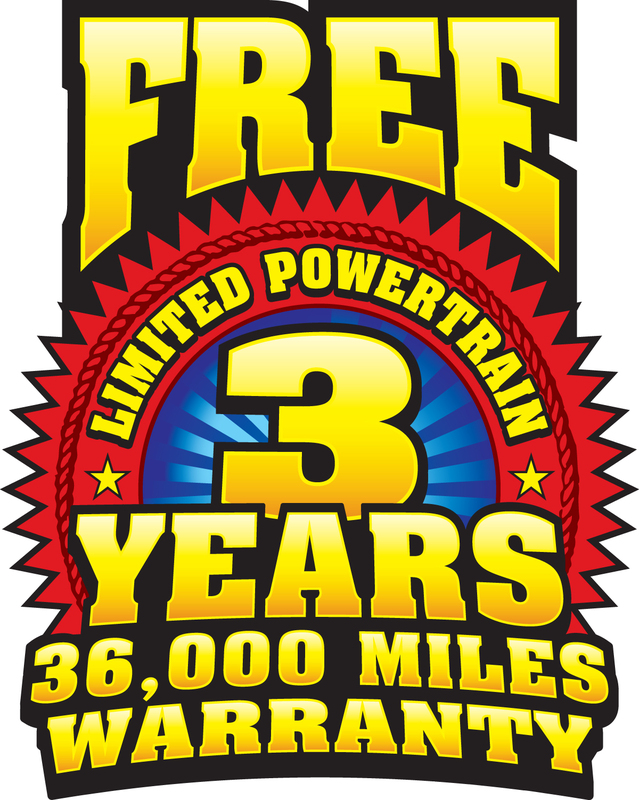 3 years /36,000 miles of coverage at no extra cost! We’re so confident in the engineering, manufacturing, quality and proven performance of our E-Force Supercharger Systems that we’re backing them up with an unprecedented new warranty. Now you can outfit your ride with an E-Force Supercharger and have the peace of mind that you’ll be covered! 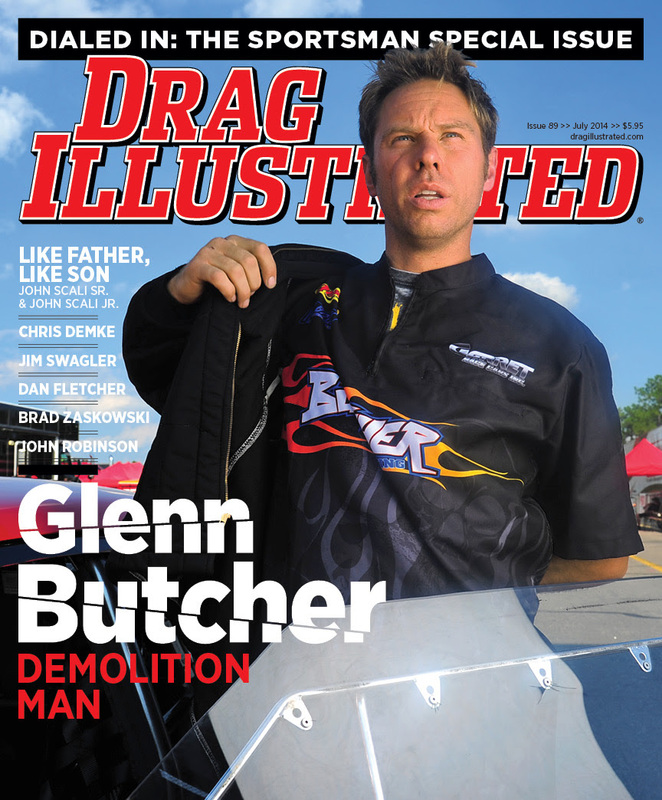 KIRKSVILLE, MO (August 8, 2014) – Drag Illustrated Media today released the digital edition of its highly popular, fourth annual Sportsman Special Issue, following the mailing of the award-winning print edition to subscribers around the globe. Drag Illustrated’s Sportsman Special Issue isn’t limited to one variation of sportsman racing, instead covering the gamut – from Top Sportsman and Top Dragster to footbrake, no-box and class racing, as well as high-level Top Alcohol categories. Additional print copies of Drag Illustrated’s Sportsman Special Issue are available in limited quantity. With unparalleled access to drag racers and opinion-forming storytelling, Drag Illustrated lights the fire for the next drag racing conversation. Drag Illustrated is not affiliated with, nor is it bound by any sanctioning body or association. Therefore free to cover a wide variety of cars, classes, events, locations and, most importantly, people. Big interviews. Insightful commentary. Delivered with the passion and energy that only drag racers can understand. Whipple releases 12-14 Jeep Cherokee SRT 6.4L Supercharger kit! Whipple Superchargers is proud to announce the release of the 2012-2014 Jeep Cherokee SRT supercharger kit. The new 2.9 liter front feed supercharger system running 8.5psi of boost makes a whopping 570+rwhp from the stock 395rwhp! Each kit comes with an oversized true-flow oval filter and cold air intake system, high flow fuel injectors, oversized heat exchanger, oversized intercooler reservoir, MSD fuel pump booster with programmable voltage curve, massive air-to-water intercooler and industry leading front feed design (without a comprimised shaft in the intake path)! Nobody packs more power and more performance as the Whipple system for the Hemi 6.4L engines! More power per dollar than any other system, the true Whipple advantage! *Kits are currently not legal in the state of California and are intended for offroad use only. Eaton Nose cone service kits are in high demand. Because of that SuperchargersOnline is offering a sale on Eaton Nose Cone service kits. This Eaton coupler is one of the main reason why a lot of Eaton supercharger owners are hearing a rattling sound in their supercharger. Once the coupler starts to ware out the holes become egg shape causing the pins that slide in the holes to bang around a cause the rattling sound. This is a simple fix to an issue that can lead to big problems down the road.